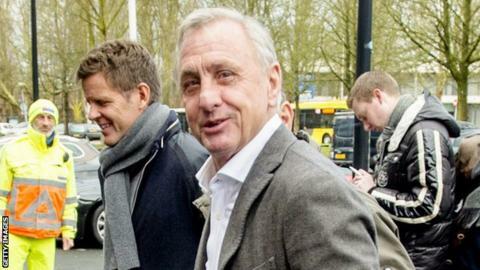 Johan Cruyff says he is "convinced" he will win his "battle" against lung cancer. The 68-year-old Netherlands great and three-time Ballon d'Or winner was diagnosed with the illness last month. "I am fully confident everything will turn out fine," said Cruyff, who played for and managed Ajax and Barcelona. "I feel good after the first time. I had no problems. My mentality is that chemotherapy is my friend because it is there to kill the cancer." Cruyff helped his country reach the World Cup final in 1974, where they lost to West Germany. He also won three consecutive European Cups as a player with Ajax. While in charge at Barcelona, he led them to their first European Cup win in 1992 and the European Cup Winners' Cup in 1989. They also won four consecutive La Liga titles from 1990-91 to 1993-94. Widely regarded as one of the greatest players of all time, Cruyff had a double heart bypass surgery in 1991. Having been a smoker, he gave up immediately after the operation and took to sucking lollipops in the dugout. He featured in a Catalan health department advert, saying: "Football has given me everything in life, tobacco almost took it all away."